UFC heavyweight champion Stipe Miocic may be getting ready to square off with light heavyweight champion Daniel Cormier in a super fight at UFC 226 on July 7. But he can’t avoid questions about Brock Lesnar. Stipe Miocic became the heavyweight champion after knocking out Fabricio Werdum at UFC 198 in Brazil back in May 2016 and has since defended the belt three times. Brock Lesnar’s current WWE contract is expected to expire after his upcoming WrestleMania 34 appearance, which has led to speculation of a potential return to the UFC. Should he actually return, he would have to re-enter the USADA drug-testing pool first and serve the final six months of his suspension before competing once again in the octagon. Meanwhile, Miocic isn’t losing any sleep over it ahead of his UFC 226 fight with Cormier. Miocic’s most recent defense was an impressive unanimous decision victory over Francis Ngannou at UFC 220 in January. 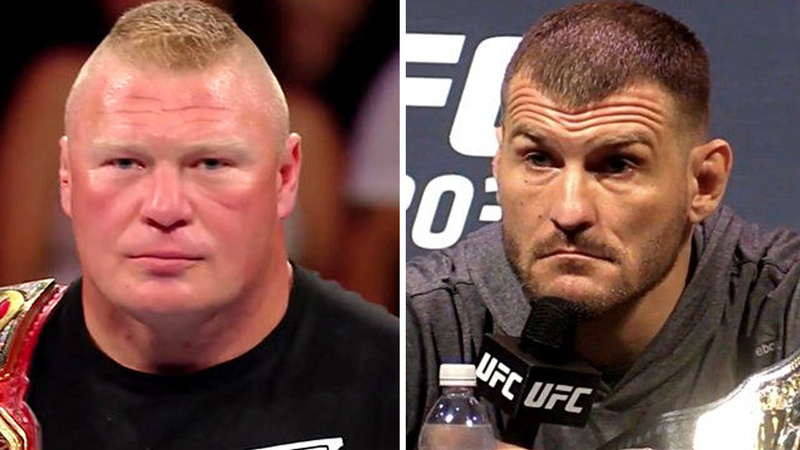 How do you think the showdown between Lesnar and Miocic will play out? Does this fight excite you, share your opinion?